Churidar Salwar, the traditional lower garment of Punjab has become more popular around the globe. 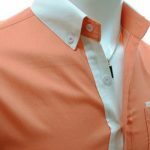 The basic pattern is modified, according to fashion, personality and requirement. Churidar Salwar has gatherings near foot. This is also known as gathering pant. This pant has long thin legs so that you can make gatherings near the foot. (5-5’) = 1”. Shape (5’-3) Crotch curve. Always cut fabric by using draft of Churidar Salwar on Bias. Take out two leg pieces. 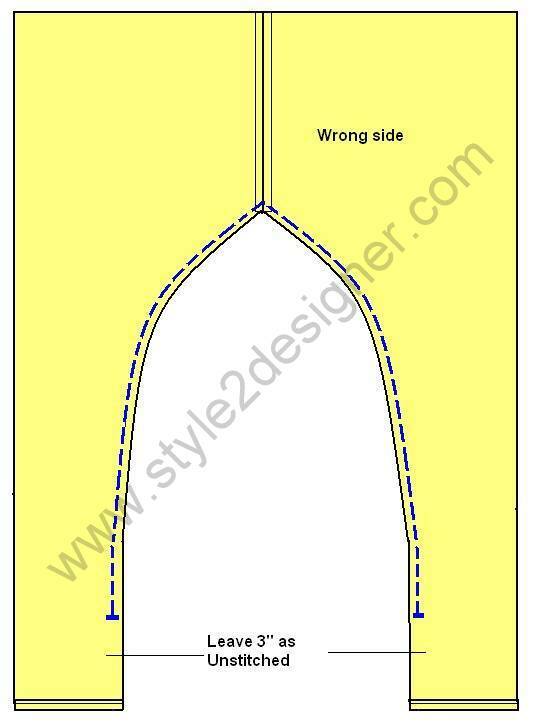 Refer HERE for how to fold (instruction) the fabric for Churidar Salwar cutting. 2. 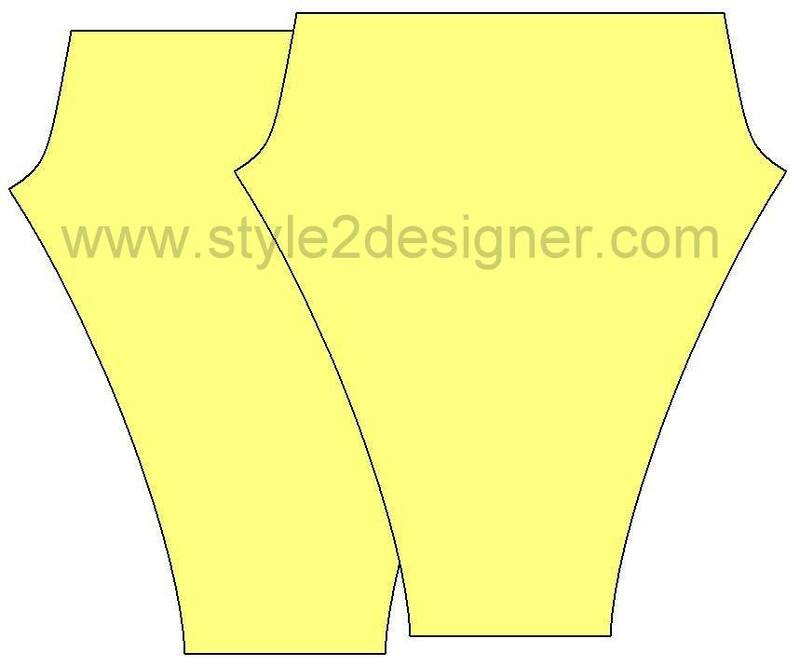 Fold ¼” on bottom of leg piece inside and fold again ¼”. Then sew along hem line. Do it again in other leg piece. 3. 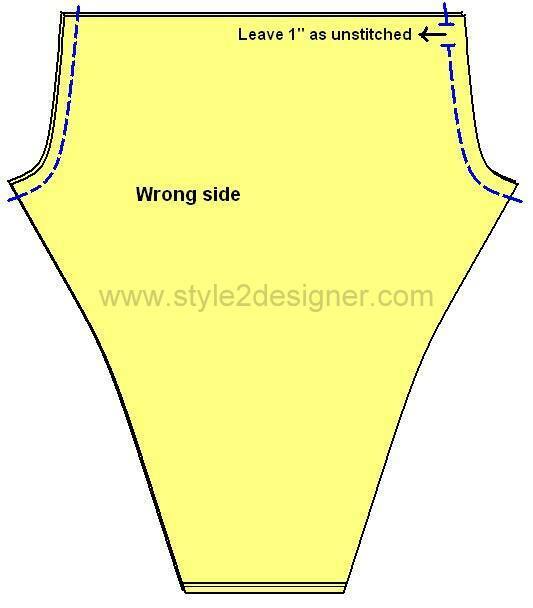 Place two pieces by facing right sides together and sew along the Crotch curve on both sides. Leave 1” unstitched as mentioned in the picture at any one side. Press crotch curve seams open. 4. 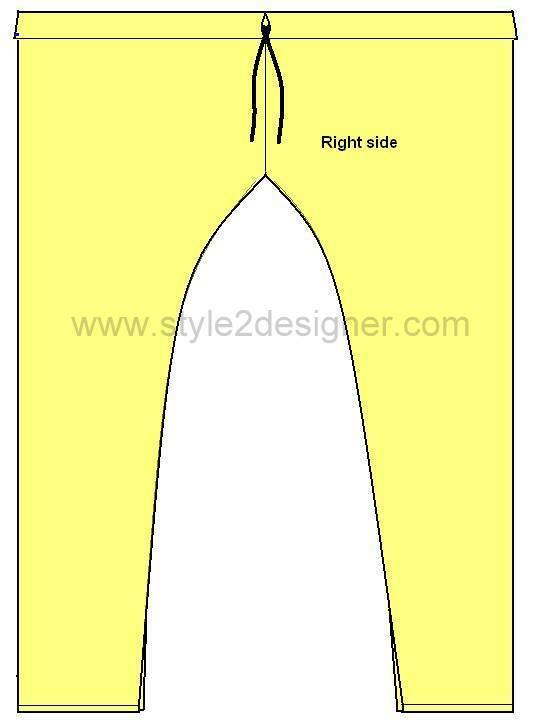 Sew along the sides of legs by facing right sides together and leave 3” at bottom of both leg pieces. 5. Fold the unstitched bottom place by ¼” inside and fold again ¼” then sew along the line. Attach hooks each side of both leg bottom side openings respectively to close the edge after wearing. 6. 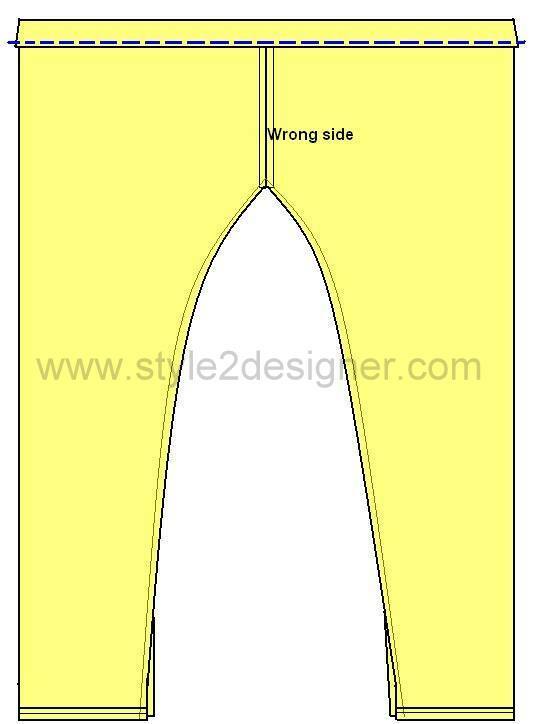 Fold ¼” inside on waist line and fold again 1” inside and sew along the edge of first folding. Now the Churidar Salwar (Pant) is ready to wear. hi this tutorial is very useful. 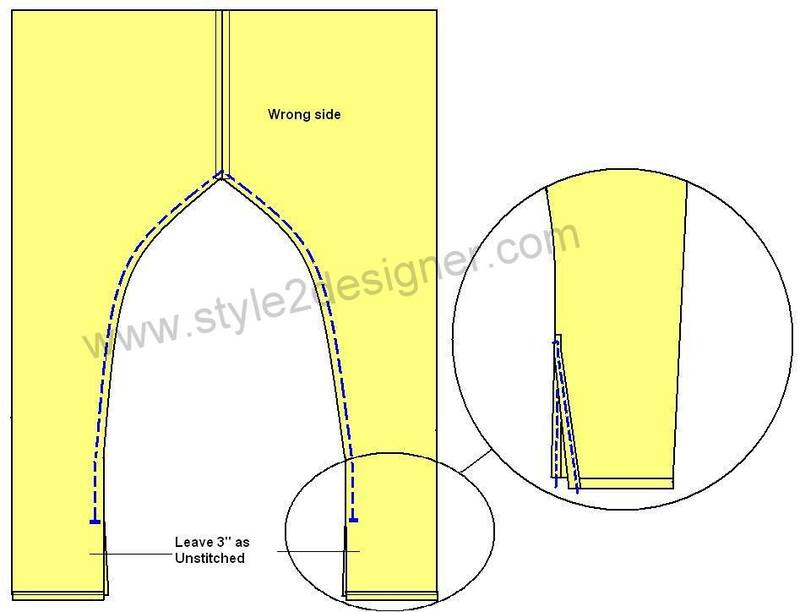 i request u to plz provide ladies trouser and palazzo cutting and sewing tutorial. Thanks for your comment pranavi.. sure i’ll do tutorials as per your request as soon as possible… Keep in touch..
Full length 37, hip 41,knee round 16,calf round 14,bottom round 12, waist to knee 20. Please correct me in leaving ease. Also, I want proper fitted pants and comfy one. Thanks to you, Keerthi Ezhil, now I can sew comfortable Churidar Salwar this summer in California. Your instructions are very clear and precise – your pattern is very good. I love this style, especially for warm weather.